At some time, everyone has a question or two about the program they are using. The Excel Help Viewer provides the answers and resources you need, including feature help, articles, tips, templates, training, and downloads. 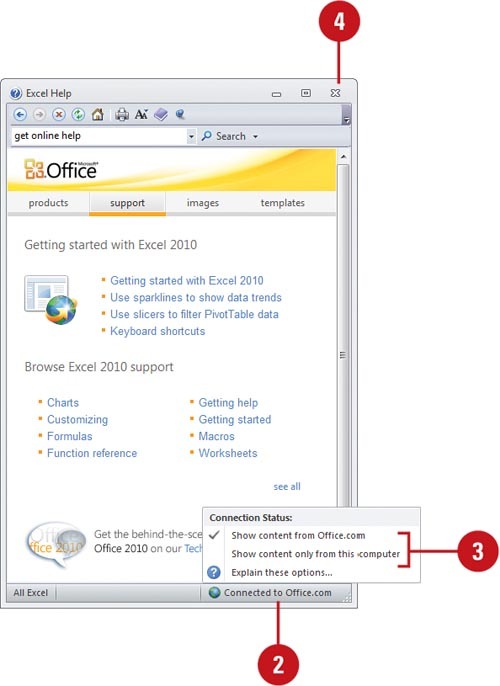 By connecting to Office.com on the Microsoft Web site, you not only have access to standard product help information, but you also have access to updated information over the Web without leaving the Help Viewer. The Web browser-like Help Viewer allows you to browse an extensive catalog of topics using a table of contents to locate information, or ask a question or enter phrases to search for specific information. When you use any of these help options, a list of possible answers is shown to you with the most likely answer or most frequently-used at the top of the list. Locate the Help topic you want. Click a Help category on the home page, and then click a topic (? icon). 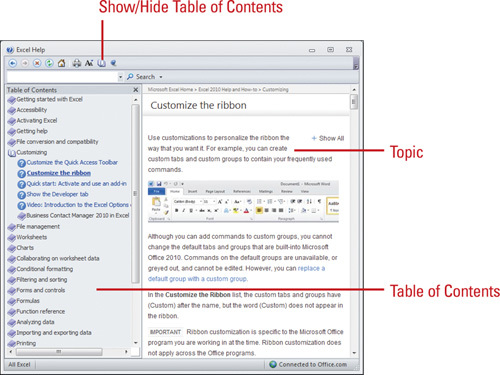 Click the Show/Hide Table of Contents button on the toolbar, click a help category (book icon) and then click a topic (? icon). Read the topic, and then click any links to get Help information. 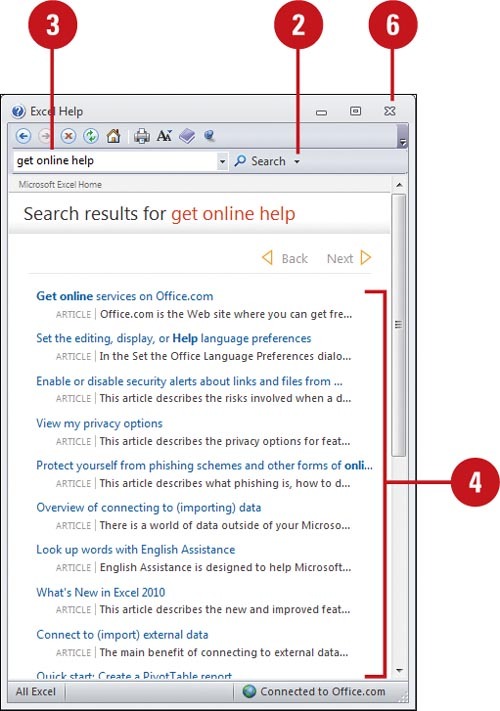 Click the Back, Forward, Stop, Refresh, and Home buttons on the toolbar to move around in the Help Viewer. If you want to print the topic, click the Print button on the toolbar. To keep the Help Viewer window (not maximized) on top or behind, click to toggle the Keep On Top button (pin pushed in) and Not On Top button (pin not pushed in) on the toolbar. Click the Search button list arrow below the toolbar, and then select the location and type of information you want. Type one or more keywords in the Search For box, and then click the Search button. Read the topic, and then click any links to get information on related topics or definitions. Click the Connection Status at the bottom of the Help Viewer. Show content from Office.com to get help from this computer and the internet (online). Show content only from this computer to get help from this computer only (offline). 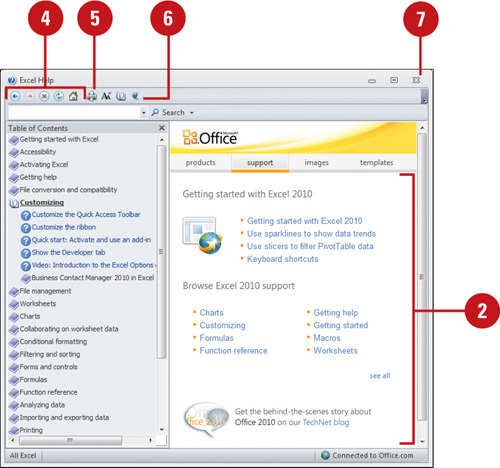 This setting is maintained for all Office 2010 program Help Viewers.